Introduction The mission of this book is to put the flora of New York City in an ecological context. Field guides and plant manuals offer almost no ecological information. On the other hand ecological texts concentrate on general principles and have only a scattering of specific plants that have been the subjects of various studies illustrating those general principles. In this volume I have taken a limited, urban-suburban flora and added to each plant description as much ecological information as I could find. In most cases, the more common plants have more information, but some uncommon plants have been subjects of a number of studies. As a measure of commonness I have noted each location at which each plant has been found since about 1985. In the descriptive section, I have combined descriptive information from Gleason and Cronquist (1991) and Fernald (1950) where the taxonomy allowed for such combinations. For horticultural plants I have also used descriptions from Rehder (1986), Dirr (1990) and Bailey and Bailey (1976). Synonyms are largely from Skinner (2005) and http://Plants.USDA.gov (2006-2015) on-line. Having searched through the literature for a number of years, it has become clear to me that we know very little about the ecology of our local flora, especially herbaceous plants (with the exception of plants covered in the Canadian Journal of Botany series “Biology of Canadian Weeds”). Basic information on relationships such as pollinators, seed dispersers, mycorrhizal associations, fungal and viral diseases, defensive chemicals and invertebrate herbivores is available for few species, other than trees (Burns and Honkala 1990). I hope that this book will help stimulate research on some of these topics. This hope is the reason I have referenced this work as heavily as possible to provide an entrance into the literature for those wishing to pursue more information on a given topic. I have attempted to include all of the plants living in the natural areas of New York City (about 1400 species). In addition to my own collections, I have relied upon the lists drawn up by Steven Clements (1999; Unpublished), Robert DeCandido (2001), Eric Lamont (2002), Richard Stalter (2002), and personal communications from Marielle Anzelone, Michael Feller, David Kunstler, Richard Lynch, Ray Matarazzo, Tim Wenskus, Ellen Pehek, Zihao Wang, and a number of other colleagues. I welcome reports of any new occurrences of any of these plants, or reports of new plants. In other words, I hope to make this book updated and interactive on a continual basis. Corrections and additions need to be referenced or corroborated. Scientific names have two parts: the first word is the “Genus” a proper noun, and is always capitalized. The second word is the “species”, an adjective, describing the proper noun, and is never capitalized even when it is derived from a proper noun, (i.e. Solidago canadensis). Scientific names are usually italicized. Euthamia graminifolia. By Donald Cameron. Copyright © 2015 Donald Cameron.New England Wild Flower Society.gobotany.newenglandwild.org (Accessed 7/2015). The changing scientific plant names used by taxonomists are a sore point for many plant enthusiasts (i.e. is it Solidago graminifolia or Euthamia g.?). However, taxonomy like other science is about discovery, and new information often dictates a change in the names used for a species. This is especially true now that DNA analysis is possible and relationships among plants can be determined at the genetic level. There are also on-going disagreements among taxonomists about nomenclature and the status of a given plant. Although I have included common names I strongly urge use of scientific names. The same common name is often used for more than one plant and one plant species may have several common names. Scientific names are unique for each plant, even when a plant has accepted synonyms. The use of scientific names is particularly important when writing contract specifications for restoration and mitigation projects. If this is done, there can be no mistake about what plants the contractor must supply. I have used as little taxonomic language as possible to make plant descriptions accessible to a wide audience. The basic botanical terms for plant parts are illustrated in the glossary or the plant family description. Botany seems to have an inordinate number of terms and although they provide a compact way to communicate plant descriptions to other botanists they shut out those who have not studied this language. I still find terms that I must look up in order to find a clear, short way of translating from the “botanese” to plain English. I have, however, stayed with the metric system for measurements since it is far more universal than American inches and feet. In the most general terms the City can be divided into three geological regions. The rocky New England Upland formations of the Bronx and much of Manhattan; the Atlantic Coastal Plain formations of Queens, Brooklyn and southeastern Staten Island; and the Triassic Lowlands forming northwestern Staten Island and southern Manhattan. The major bedrock formations in the Bronx, Manhattan and some of northeastern Staten Island are part of the metamorphic Manhattan Prong, consisting of erosion resistant Fordham Gneiss, Manhattan Schist and Hartland Formation, with more erodible Inwood Marble (from which the name “Marble Hill” originates) underlying the valleys. Northwestern Staten Island also has a set of formations that includes Palisade diabase and Brunswick shale. Central Staten Island is formed by a unique outcrop of serpentine, a remnant of the Taconian Orogeny (mountain building episode) 460 million years ago; (Schuberth 1968; Baskerville 1982; Isachsen et al. 2000; Sickies written communication). During the Wisconsin glaciation, about 21,750 years ago, ice covered the City south to about halfway through Queens and Brooklyn and along southeastern Staten Island. 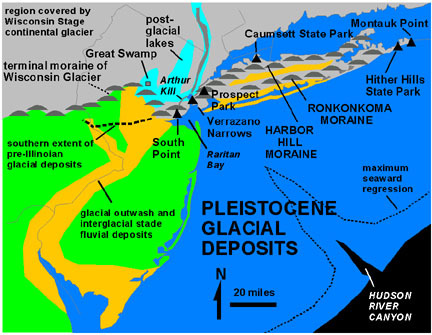 As the glaciers began to retreat some 18,000-14,000 years ago they left the sandy, gravelly, unconsolidated terminal moraine and outwash plains that form the south shore of Staten Island and all of Long Island including Brooklyn and Queens (Isachsen et al. 2000). Numerous kettle ponds dotted those boroughs and are still visible in some larger parks (Lefkowitz and Greller 1973; Baskerville 1982; Greller and Garcia 1986; Stalter 1981). Terminal moraine.Jim Pottinger.Russell Glacier, Greenland.” Courtesy of Arctic Research Consortium of the United States.”Photo by Jim Pottinger (PolarTREC 2011, www.polartrec.com), (Accessed 7/2015). Kettles holes and ponds were formed by remnant ice blocks that were buried by glacial debris and melted very slowly after most of the land was ice-free (Baskerville 1982; Isachsen et al. 2000). glacialMap.imnh.isu.edu For two long periods: from 75,000 to 45,000 years ago, and again from 25,000 to 14,000 the Bering land bridge was exposed. During several thousand years after the ice melted, plant species migrated northward forming various floral communities as different species reached this latitude (Pielou 1991; Davis 1969; Davis 1981). The present botanical assemblage was probably relatively stable for about 4,000 years before Europeans colonized this region in the early 1600s (Greller 1988). 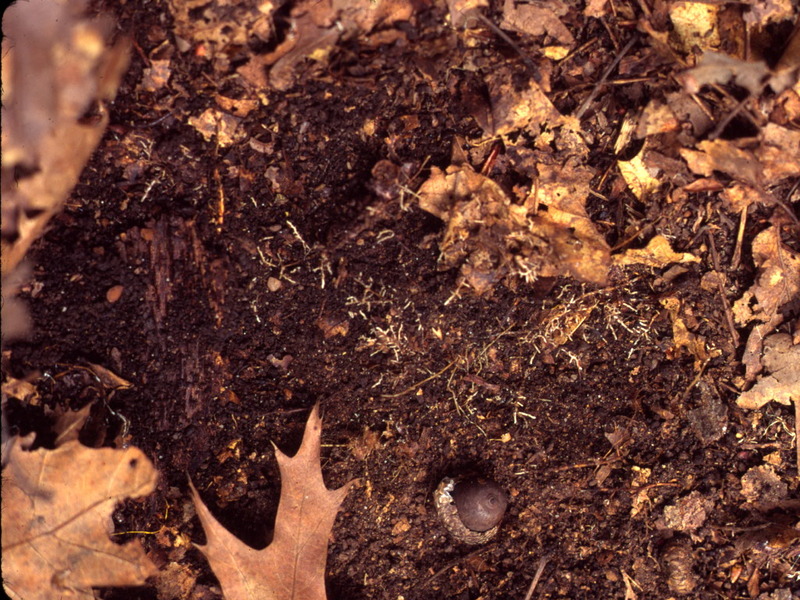 However, chestnut, a forest dominant before the 1920s, did not arrive in southern Connecticut until about 2000 years ago (Davis 1981; Cronon 1983). 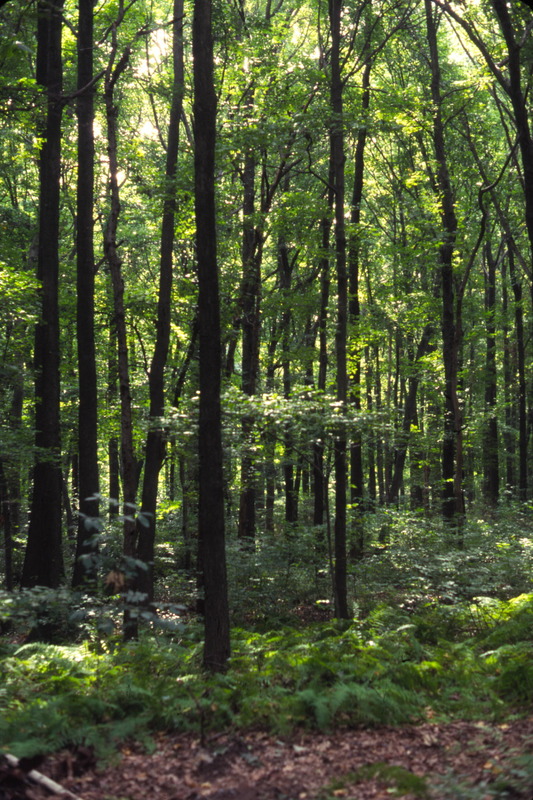 Dominant vegetation of the northeastern United States is forest. The New York Metropolitan region receives an average rainfall of roughly 44 inches (110 cm) distributed fairly evenly throughout the year (Collins and Anderson 1994). This means that, given sufficient time, woody vegetation will become established on undisturbed sites in virtually any soil type, including dry, sandy soils of back dunes and pine-barrens (Stalter and Lamont 1987). The periodic disturbance of storms, fires or clearing is what keeps some sites open (this is not including toxic waste sites, where soils are poisoned by heavy metal contamination). However, the unchecked deer populations, especially in more suburban ares, are destroying seedlings of oak and other trees. In time, as old trees die, the openings left could give way to non-native vine-lands and shade tolerant exotic trees such as Norway maple. 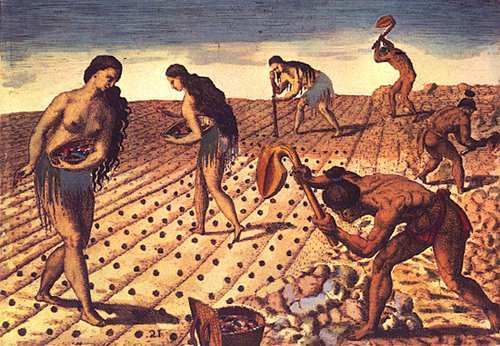 There is a good deal of controversy regarding some aspects of the vegetation in New York City and the region prior to European colonization. This centers mostly on how much Native Americans influenced the landscapes with burning and agriculture (Askins 2002; Day 1953; Russell 1983; Cronon 1983). 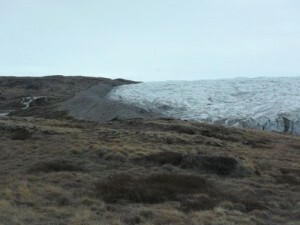 There has certainly been human influence on the region since the glaciers retreated and forest species migrated northward (Collins and Anderson 1994; Pielou 1991; Whitney 1994). There is no doubt, however, that for the past several thousand years, forest covered most of the landscape that was not too wet or disturbed to support woody vegetation. Openings were the exception in a forested landscape. Even in extensively farmed areas, agricultural land had to be rotated as the soil wore out, and forest quickly reclaimed these open areas as other sites were cleared in turn. 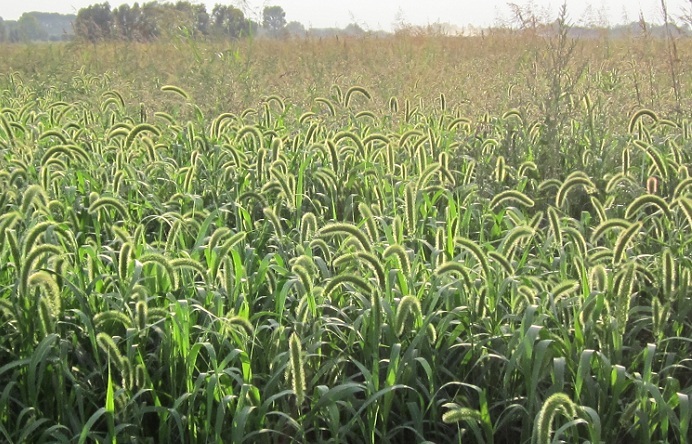 Plants adapted to full sun of open areas, now associated with post agricultural fields and meadows, undoubtedly colonized agricultural plots abandoned by Native Americans. However, these plants evolved long before humans migrated to North America. They are plants originally found on cliffs, river banks and other marginal sites that are kept open by flooding, severe doughtiness, storms, rock falls or other periodic disturbances (Marks 1983). Photo: Beaver pond and meadow. Dan L. Perlman.www.ecolibrary.org (Accessed 5/2014). Another important source of disturbance were beavers. These large rodents created ponds and clearings by building small dams across streams and clearing trees in the vicinity. Beaver ponds, like all other ponds, slowly filled with silt and organic debris. In time the beavers abandoned the site and the remnant pond drained. Temporary meadows formed as the deforested edge and pond basin were re-vegetated. Beaver meadows were a common, re-occurring part of the ecosystem and vital habitat for plants requiring full sun and moist to wet soil (Freiday 2002; Haemig 2005; E. Pehek personal communication; Wright et al. 2002). M.B.Gargiullo.Back Dune Forest. Staten Island. NY (probably about 2000). Along the coast, back dune forests are often subject to severe storm damage that can create large open areas or cause extensive die back from heavy salt spray or flooding. It is also of interest to note that woody plants (mangrove forests) do not grow in tidal areas where winter temperatures drop below freezing. The formation of an ice layer, in conjunction with tidal and wave action, most likely makes it impossible for woody stems to survive over the winter in cold, tidal habitats. Ice storm damge to a forest.broken1.wheelersmaple.com (Accessed 7/2015). Without human initiation, fire is a very infrequent cause of disturbance in this part of the country (Day 1953; Pickett 1980). Unlike the western United States, we very rarely experience dry lightning, the regular cause of fires in the west (see Quercus rubra). NOAA (National Oceanic and Atmospheric Administration) defines dry lightning as that occurring with less than 0.1 inch (0.25 cm) of precipitation (P. Bothwell personal communication). In the northeast, lightning is virtually always accompanied by rain. Oak fire scar.Henri D. Grissino-Mayer, Department of Geography, The University of Tennessee.wed.utk.edu (Accessed 7/2015). 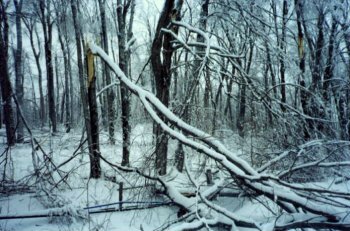 In places without human interference, forest succession and renewal in northeastern North America are mainly driven by periodic wind or ice storms that cause blow-downs and otherwise open the tree canopy (Small 1961; Pickett 1980; Canham and Loucks 1984; Seischab et al. 1993). Prolonged drought may also open canopy gaps as susceptible trees die. Drought stress may also allow infection by opportunistic fungal pathogens (Small 1961). 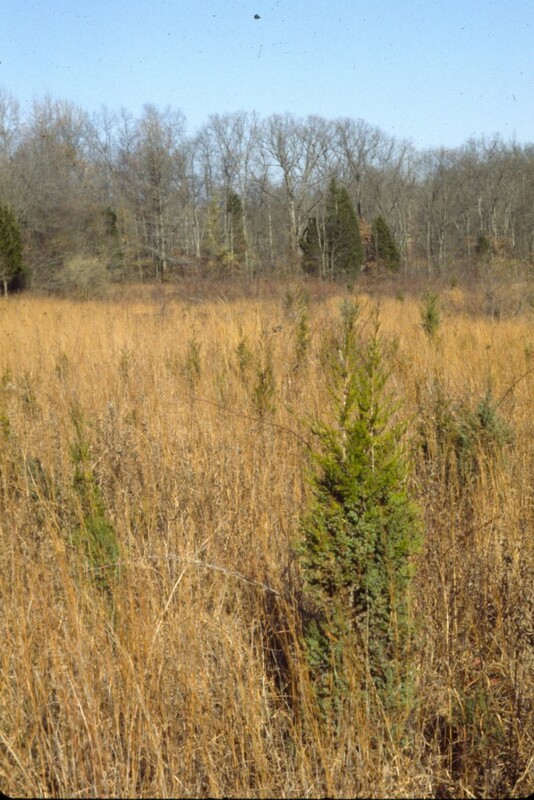 With the exception of some pine barrens species, our native plants are not adapted to fire, although many species can survive light ground fires such as those set by Native Americans near their settlements. A section through a wind thrown, 324 year old white oak trunk from central New Jersey, showed fire scars at an average of every 15 years from 1641 until 1701, when white settlers arrived at the site (Greller 1985; Buell et al. 1954). 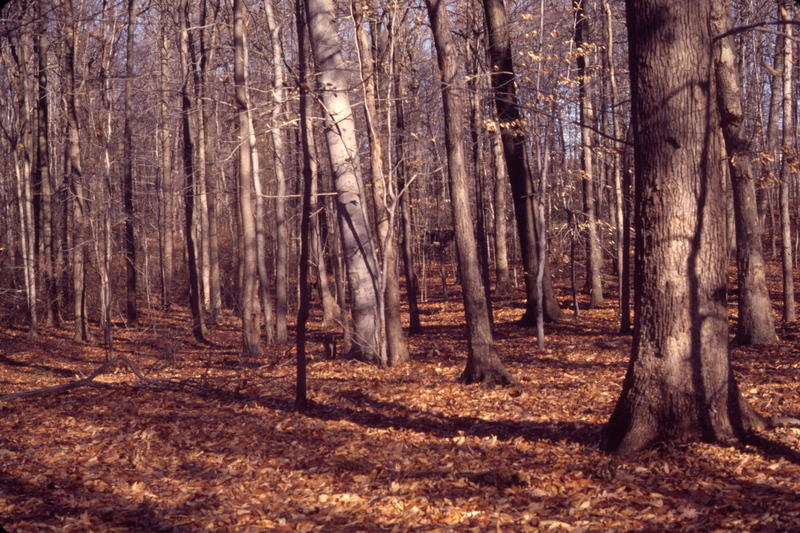 The forest community of the New York City Region has been classified as Oak-Chestnut (Braun 1950; Greller, 1988). However, the American chestnut (Castanea dentata) has not been a dominant tree since it was decimated by chestnut blight during the early 20th century. Today, oak forest generally dominates dry uplands but sweetgum, beech and red maple appear to dominate moist forests. 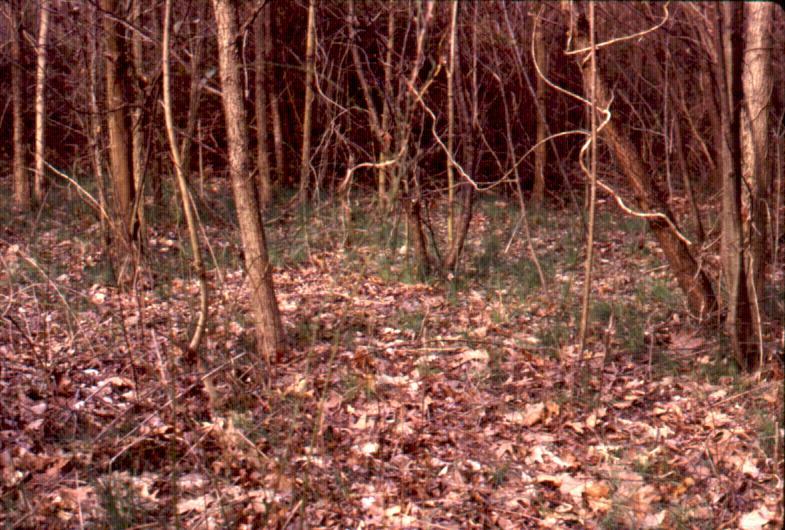 A study of Appalachian forests in 1970 show that hickory has become a co-dominant along with oak in some forests (McCormick and Platt 1980). It may be time to reconsider the forest classifications of Braun (1950), at least for areas where chestnut was once dominant. Beginning with European colonization, the continuous forest canopy was cleared for agriculture and timber. By the late 1800s forests had been reduced to small, discontinuous fragments (Whitney 1994). In the 20th century, as farms were abandoned, forest regeneration increased. M. B. Gargiullo: Willowwood Arboretum.NJ.ca 1991. Old field.Red cedar and other woody plants gradually replacing grass-land. 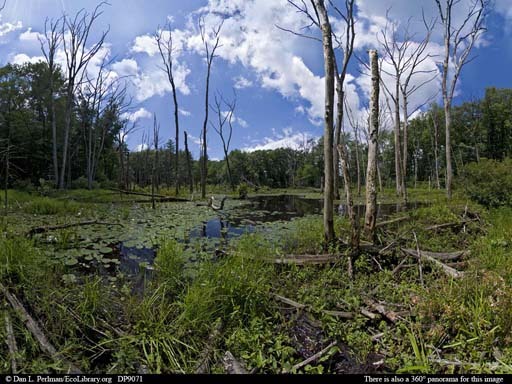 The redevelopment of a forest on agricultural land is one of the most intensively studied subjects in the ecology of northeastern North America (Odum 1971; Keever 1979; Keever 1983; McDonnell and Stiles 1983; Pickett and White 1985; McDonnell 1986; Barbour et al. 1987; Pickett and McDonnell 1989; Carson and Pickett 1990; Goldberg and Miller 1990; Cadenasso 2002). The most fundamental aspect of these studies is the knowledge that, without large-scale disturbance, forest will develop on open soil anywhere in this region. This developmental sequence is referred to as succession, that is, one plant community succeeds another over time on a previously disturbed site (a plowed field, burned over, or bulldozed vacant lot or new deposition of fill soil). The sequence of plant species establishment is governed by light and moisture requirements, seed availability, and growth rate of the colonizing plant species. The first plants to establish on open soil are usually annual herbs and grasses that require full sunlight and are present in the soil as seeds. These annuals include, ragweed (Ambrosia artemisiifolia), horseweed (Conyza canadensis), and foxtail grasses (Setaria sp.). 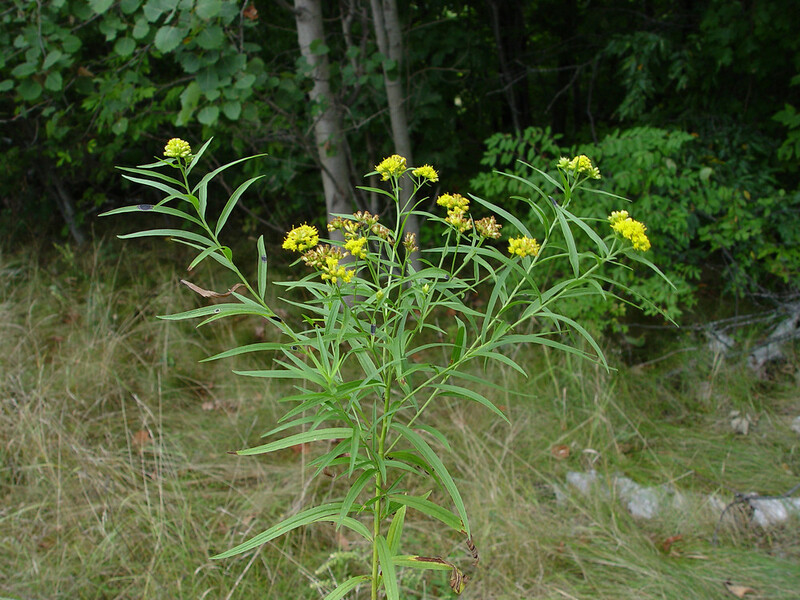 Perennial herbs such as goldenrods (Solidago sp. ), asters, and mugwort (Artemisia vulgaris) are slightly slower to become established. They colonize the site from soil seeds or from surrounding vegetation. All these plants are very intolerant of shade, grow very rapidly and are tolerant of a wide range of soil conditions. Preliminary successional stages can be observed on any pile of soil if it is left in place for a year or two. Setatia viridis.Marco Banzato and Roberto Masin.actaplantarum.org (Accessed 7/2015). Woody species that need full sun become established within another few years. These are usually referred to as “pioneer” species. Some of our most common native pioneer species are eastern cottonwood and other poplars (Populus sp. ), wild black cherry (Prunus serotina) and sumacs (Rhus sp.). 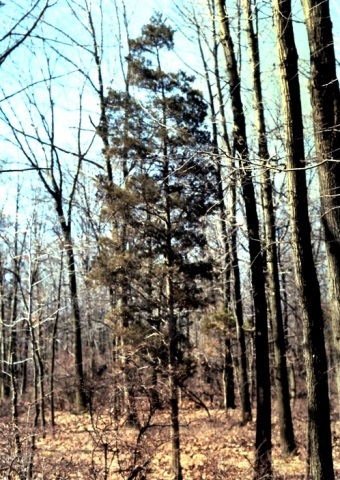 In areas outside the City, eastern red cedar (Juniperus virginiana) is also very common. Unfortunately many aggressive exotics also fall into this category and can rapidly dominate open sites. These include multiflora rose, (Rosa multiflora) porcelainberry (Ampelopsis brevipedunculata), oriental bittersweet (Celastrus orbiculatus), autumn or Russian olive (Elaeagnus sp. ), white mulberry (Morus alba), black locust (Robinia pseudoacacia) and tree of heaven (Ailanthus altissima). Photo: M. B. Gargiullo.Eastern red cedar being shaded out (ca. 1991). These fast growing species, are usually the first to attain full size and begin to shade out the least shade tolerant herbs. In time, slower growing and more shade tolerant species begin to colonize the site. At first oaks and hickories become established in a shrubby woodland. Eventually these are followed by the most shade tolerant species such as sugar maple (Acer saccharum), beech (Fagus grandifolia) and maple-leaved Viburnum (Viburnum acerifolium). There are also a number of shade tolerant invasives such as Norway maple (Acer platanoides), sycamore maple (Acer pseudoplatanus), Japanese honeysuckle (Lonicera japonica) and several species of exotic bush honeysuckles (Lonicera maackii, L. morrowii, L. tatarica) that can take over woodlands and exclude native plants. The City has numerous examples of successional woodlands dominated by these exotics. Even mature forests are not static, however. They are dynamic systems in which individual plants germinate, grow, mature and die. The forest is continually regenerating itself. When a tree dies, or a gap is opened in the forest canopy, the fallen trees are replaced by others that are either present in the understory or carried in as seeds by wind or animals (Runkle 1982; Runkle 2000; Forrester and Runkle 2000). In a continuously forested region, where open sites are the exception, plants can migrate from site to site over time, whether by wind, birds, mammals, reptiles or ants (Handel 1978; Thompson 1981). If a plant becomes locally extinct, there is a good chance that the same species can immigrate from other parts of the forest. 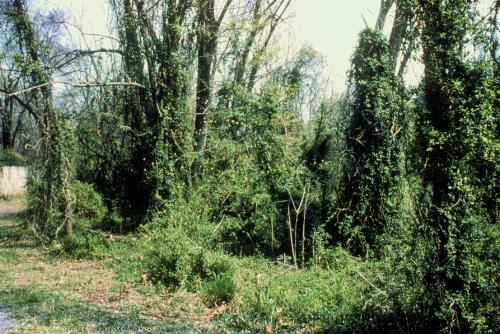 Today, forest in urban and suburban areas occurs in isolated patches and plants cannot migrate from site to site, especially if they are dispersed by ants, as are many forest herbs (Matlack 1994). As species drop out of isolated woodland patches, they are not replaced and the flora becomes increasingly depauperate. Photo: Given’s Creek Park.Bronx NYC. Tim Wenskus.NRG.City of New York Dept. of Parks. & Recreation. (ca 2000). Out of the 28,000 acres of Parkland in NYC, 10,000 acres are natural lands including forest, saltmarsh, freshwater swamps, and weedy growth on fill soils. The plants growing on highly disturbed soils contaminated with demolition debris, construction debris, concrete, blacktop, coal ash, and household garbage are perhaps the epitome of “urban habitats.” They support vegetation from a sparse cover of grass and herbs in vacant lots to young successional woodlands and closed canopy forests, such as stands of Norway Maple, Ailanthus, and Asian mulberry. Photo: Allium vineale and vines in young understory. M. B. Gargiullo 2000. Even in forests on native, undisturbed soils, young, regenerating woodland fragments are either too far from other populations of native forest species or have been overrun by invasive plants that exclude less aggressive native herbs and shrubs. 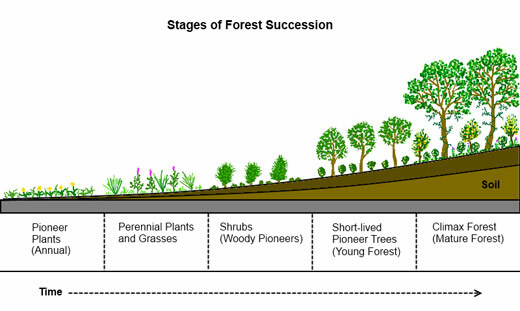 It is common to see regenerating woodlands in the New York City region in which the entire ground layer is composed of exotic invasive species such as Japanese honeysuckle, garlic mustard (Alliaria petiolata), Japanese stilt grass (Microstegium vimineum), and wild garlic (Allium vineale). Since all of these are either shade tolerant or spring ephemerals, they are permanent residents of the newly developing forest floor and will not be replaced by native species. In urban and suburban areas the seeds that are most abundant are often those of aggressive exotic species and disturbed soil is very often colonized by exotic trees, shrubs, and vines that displace natives plants. 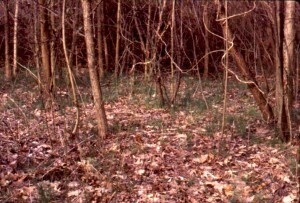 In the worst cases, gaps are colonized by porcelainberry, Japanese honeysuckle and oriental bittersweet which grow very rapidly smothering any tree and shrub seedlings that start to grow up in the site. This ultimately results in large “vinelands” that prevent forest regeneration. In other cases a site may be colonized by Norway and sycamore maples both of which have very dense canopies that shade out native shrubs and herbs (Webb and Kaunzinger 1993; Webb et al. 2001). In the suburban region surrounding New York City, deer populations have become far greater than can be sustained by the landscape. Many forested areas are failing to regenerate due to intensive browsing by white-tailed deer (Townsend et al. 2002). While there are no “virgin” forests in New York City, a number of sites, particularly in the Bronx, and Queens, have trees over 150 or 200 years old. 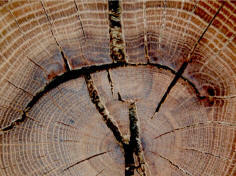 Old forests are usually invaluable as repositories of rare species and high quality ecosystem functions. However the understories of these urbanized forest remnants are quite disturbed and contain only fragments of the pre-colonial shrub and herb assemblages that could once be found in the City. The big trees are the last to go. It is the herb community that acts as the “canary in the coal mine” warning of degraded ecosystems (Gilliam and Roberts 2003). The urban and suburban areas of the New York Metropolitan region have been subject to intensive human use since Europeans settled here in the 1600s. Land has been cleared of native forest, plowed, grazed, logged, burned over, built upon, paved, abandoned and rebuilt. Salt marshes and freshwater wetlands have been filled with everything from transported soil, to garbage, coal ash, concrete, brick and asphalt debris, muck and sandy dredge spoils. Hundreds of horticultural plants, agricultural weeds, soil invertebrates, insects, birds, and mammals have been introduced from Europe, Asia and Africa over the past 350 years. In addition, lead and other heavy metals have soaked into the soil during the past hundred years of intensive industrialization (McDonnell et al. 1997; Pouyat and McDonnell 1991; Pouyat et al. 2003). Photo M. B. Gargiullo ca 2000. Decaying leaf layers forming humus with mycorrhizal fungi at bottom. In an ongoing series of studies, soil characteristics along a gradient from urban New York to rural Connecticut have been examined and found to vary markedly with location on the gradient. Since soils have a profound effect on plant communities, the changes in urbanized soils are significant for New York City flora. Urban soils are higher in heavy metals and nitrogen than rural soils, which may account for their low populations of soil invertebrates. They have more exotic earthworms and fewer mycorrhizal fungi, which results in more rapid leaf litter decay and nutrient cycling, and low accumulation of humus. Urban soils also tend to be hydrophobic probably because of increased hydrocarbon input (White and McDonnell 1988; McDonnell and Pickett 1990; Pouyat 1992; Pouyat et al., 1994a; Pouyat et al. 1994b; Pouyat et al. 1995; Pouyat et al. 1996; Pouyat et al 1997; Steinberg et al. 1997). In addition, studies of exotic vegetation are showing that some plants can change local soil chemistry to favor their own perpetuation (Kourtev et al. 1999; Heneghan et al. 2002). Photo: M. B. Gargiullo.Long Pond Park, S. I. NYC. with abandoned, burned car. (ca 2000). 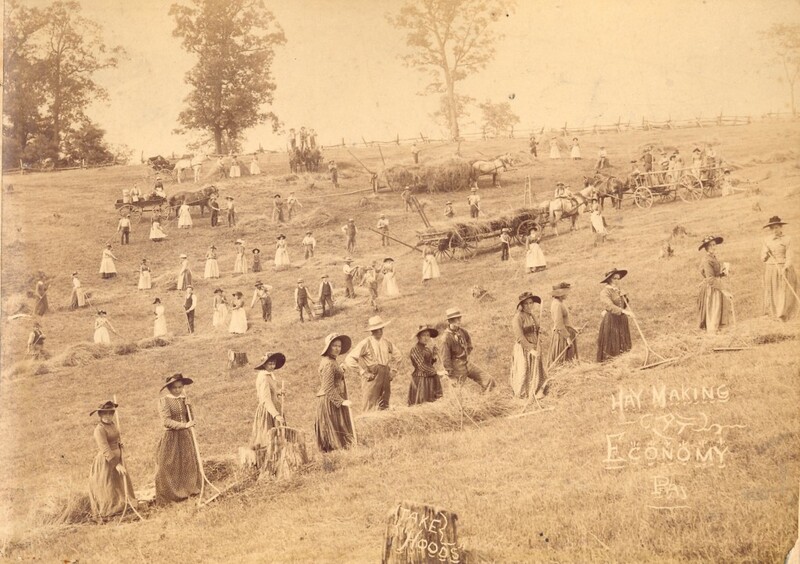 In New York City, urbanization grew even as agricultural fields were being abandoned. Urbanization involves enormous habitat loss for native plants and soils. 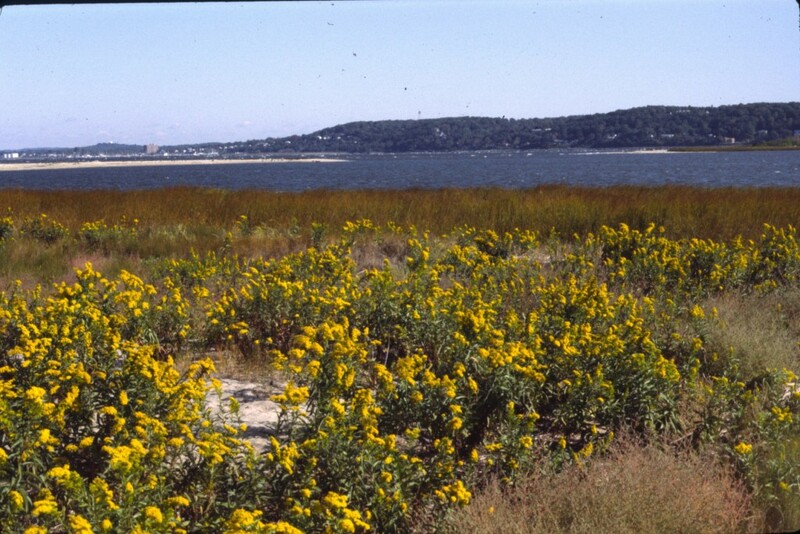 Staten Island has lost over 40% of its native plant species during the last 100 years. Over 33% of the plants now present on Staten Island are non-native (Robinson et al. 1994; Siebenheller 2003). A recent intensive study by R. DeCandido (2001) found an overall loss of 43% of the native flora of New York City since 1925. At the same time the proportion of non-native species increased by 37% just since 1949 (DeCandido et al. 2004). Aside from loss of native flora and biodiversity, deforestation has enormous effects on water quality in urban areas. Even the loss of forest cover, without an increase in impervious surfaces has been shown to increase run-off, soil nutrient loss, water pollution and algal growth in a previously forested drainage system (Likens et al. 1970). The enormous areas of pavement and buildings in a city greatly exaggerate these effects. Because the processes of forest regeneration have been disrupted by urban development and continual human disturbance, it becomes increasingly necessary to actively restore damaged fragments of natural land lest we loose what remains of our native flora. 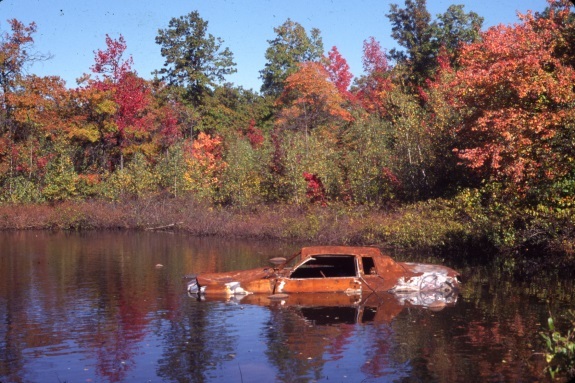 Understanding the ecology of our forests, wetlands and shores is critical to accomplishing successful restorations. It must be clearly understood how a plant fits into the total ecosystem and that it is not a piece of static infrastructure. The ultimate success of a restoration is a plant community that is growing, reproducing and changing as naturally occurring communities do. If soils, hydrology, likely disturbance regimes and surrounding ecosystems are taken into account, there is a better chance that restoration projects will succeed in being self-sufficient. Exotics are escaped, naturalized, or in abandoned garden sites in natural areas. Code = first two letters of genus and first two letters of species. In cases of duplication add 2, 3 etc. to end of code; x = hybrid. * = alien; *p = alien pest species; (*) = not native to New York City but native to areas near by. OBL = >99%; FACW = 67-99%; FAC = 34-66%; FACU = 1-33%; UPL = 0% (same as NL, not listed) + = incidence in wetlands at high end of percentage range; – = incidence in wetlands toward low end of percentage range (Porter, 1988). 1) Collection by M. B. Gargiullo, Marielle Anzelone, Ray Matarazzo (R), Dave Kunstler (Bx), Richard Lynch (R). Many specimens identified by S. Clemants, G. Moore and S. Glenn, Brooklyn Botanic Garden. 2) Published collections of plants in NYC made after 1990 Those made Prior to 1990 are noted with the entry (Greller, 1977, 1979, 1985). Also: Greller et al. 1991; Yost et al 1991; Stalter, R. and E. E. Lamont 2002; Stalter and Munir 2002; Stalter, R. and N. Tang. 2002). 3) Clemants, S. 1999. New York Metropolitan Flora, New York City Checklist. Brooklyn Botanic Garden. 4) DeCandido, R. 2001. 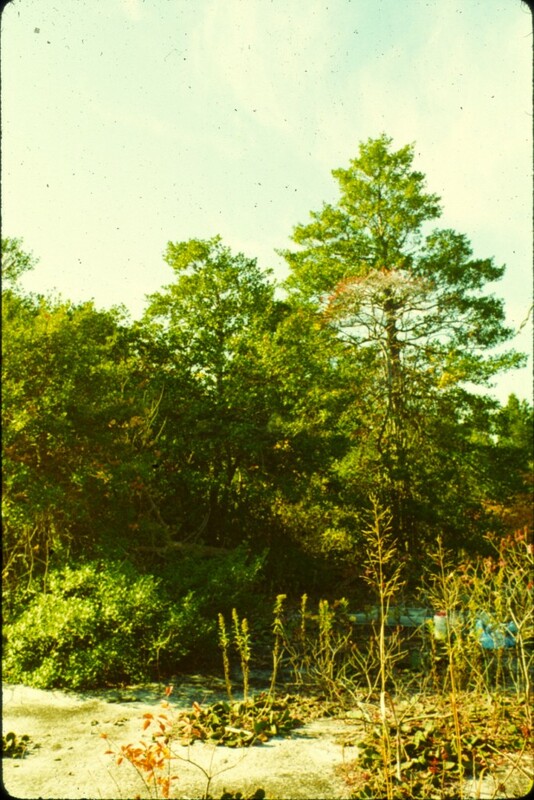 Recent Changes in Plant Species Diversity in Pelham Bay Park 1947-1998, Bronx County, New York. Ph.D. Dissertation. City University of New York. Locations of plants (listing one location does not preclude unlisted locations): (x) indicates plant has since been extirpated from site. Bronx: Bx = Bronx Co.
Manhattan: NY = New York Co.
Queens: Q = Queens Co. Ally Pond = a; Baisley Pond Park = ba; Breezy point = bp; Brookville Park = bv; Bayside = by; Bayswater = bw; Cross Island Pkwy (near Ft. Totten) = ci; Crocheron Park = cr; Cunningham Park = cu; Dubos Point = dp; Forest Park = f; Flushing Airport/College Point = fa; Forest hills = fh; Flushing Meadows = fm; Far Rockaway = fr; Fort Totten = ft; Goose Pond (Captain Tilly Park = gp; Highland Park = hl; Idlewild Park = I; Jamaica Bay Wildlife Refuge = j; Kissena Park = ks; Lefrak City area = lk; Locust Manor = lm; Queens Village = qv; Rockaway Beach = rb; Roy Wilkins = rw; Fort Tilden = tl; Udall’s Cove Preserve = u; Vernam-Barbados = vb; Willow lake/Meadow lake = wl. Brooklyn: K = Kings Co.
Staten Island: R = Richmond Co.
Genus species Common name Family. Species CODE; Locations in NYC: Bronx (Bx); Manhattan (NY); Queens (Q); Brooklyn (K); Staten Island (R). Vegetative characters, habit. Leaves. Flowers. Fruit (Fernald 1950; Gleason 1952; Gleason & Cronquist 1991; Mitchell and Tucker 1997); Wetland status (Reed 1988). Frequency in NYC. Very common (more than 45 occurrences noted); Common (45-31 occurrences); Frequent (30-21); Occasional: (20-11); Infrequent (10-4); Very infrequent (3-1, native plants probably rare in NYC); Rare (see Young 2000). Origin: (Fernald 1950; Gleason 1952; Hough 1983; Gleason & Cronquist 1991). 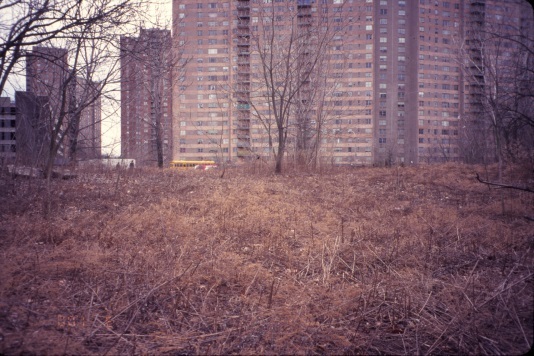 Habitat: Habitat observed in NYC, also (Fernald 1950; Gleason 1952; Gleason & Cronquist 1991). Notes:/ Ecological notes: Other information as available. Botanical nomenclature follows Gleason and Cronquist, 1991. Occasional exceptions are from the New York Rare Plant Status List, by New York Natural Heritage Program. Synonyms are generally from USDA Plants. Acknowledgements: Marielle Anzelone for taking up the torch and continuing to work at preserving what we still have. Also for her excellent, ongoing inventory work that has contributed much to this volume. Margaret Carreiro, Ph.D. U. Louisville, KY, for her information on mycorrhizal fungi; Robert DeCandido, Ph.D. for his entire dissertation from which I have drawn so heavily, including his listing of the current flora of New York City; Steven Clemants, Ph.D., Gerry Moore, Ph.D. and Steven Glenn Ph.D., of the Brooklyn Botanic Garden for their invaluable help with plant identifications. Tony Emmerich, NYS DEC Forester Region II (retired) for advice, assistance and ecological discussions over all this time; Michael J. Feller, NYC Parks, Deputy Chief, Natural Resources Group for his endless knowledge of New York City natural areas, of weedy plants and the use of his extensive library; Richard Kruzansky, Prospect park Conservancy for all his soil testing and information on soils; Richard Lynch, Botanist, for all his information on rare plants of Staten Island and many field trips to find them; Ray Matarazzo, Staten Island Institute of Arts and Sciences for all his information on plants of Staten Island and where to find them; Dave Kunstler for his continuing inventory of Bronx Parks. Ellen Pehek, Ph.D., NYC Parks NRG, for information on animal ecology and critters of all kinds; Tim Wenskus, Head Forester, NYC Parks, NRG for our extended collaborative efforts on restoration and forestry in New York City woodlands. Zihao Wang who continues the work of looking for new plants an old plants in new sites. Dave Taft who also finds new plants and old plants in new places. David Burg with “Wild Metro.” Erik Danielsen, Del Orloske and others who have contributed plant photos. Marc Matsil, NJ DEP (formerly Chief, NYC Parks NRG), and Bill Tai, former Director of NRG, for giving me the freedom to work on this project. I would also like to thank my son, Michael Gargiullo, for constructing this website and helping me put this book together on the website. All photos (except those by author) accessed 2013-14 from https://www.google.com/ 4/2014 – 11/2014.Photos accessed from 2015 0n are from Bing.com.